Do You Sell Test Kits for Fluoride? Oh, how we wish we DID know of a simple test kit for fluoride… because we have folks like ‘Mark’ asking us, “do you sell Fluoride tests kits? if so how much do they cost?” all the time! 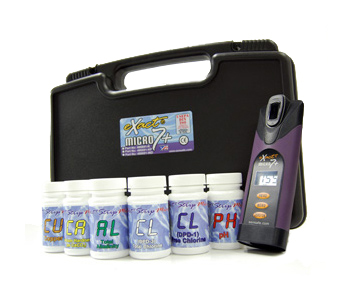 Right now we know of only two test kits that the general public can make use of to test the fluoride content of their water: 1) National Testing Labs Fluoride Test Kit (mail-in); 2) eXact Micro 7+ Water Testing Meter (w/ fluoride reagent). While many people in positions of authority believe fluoride a great additive for the public water supply, many others see it as a dangerous poison capable of doing massive damage to the population if no one monitors its levels. Also, some people have severe, and sometimes fatal, allergic reactions to fluoride. No matter what side of the fluoride Great Fluoride Debate you may find yourself, the fact remains that small amounts of fluoride can have beneficial effects on teeth and too much fluoride can harm a person over time. Therefore, like any other water supply additives that serve a purpose (i.e. chlorine used to disinfect drinking water), we believe its concentration need to stay on the radar of water treatment operators at all times. « Who Do I Contact for Well Water Testing?